As for relaxing in the evening, Trnovski pristan is always crowded with people, especially with loud youth, so I prefer going to Park Gradaščica. 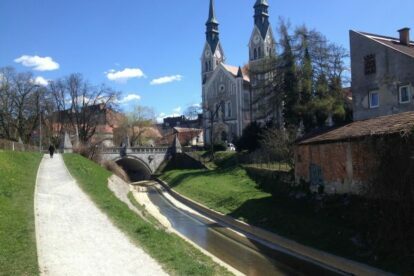 It is located in Trnovo next to the Gradaščica stream, one of the affluents of river Ljubljanica. I like it because, contrary to Tivoli, it is smaller and less crowded. Being near the river also makes it less warm than other parks. I come here to read or do some tai chi. It is also a nice spot for frisbee and lonely dog walkers. Just at the end of the park summer swimming pool (see article Mestno kopališče Kolezija) is located, where you can relax while swimming, playing table tennis or beach volleyball. In Park Gradaščica a new self-sufficient house was built, called Cell. It is a project of the Faculty of Mechanical Engineering and various business partners to research the possibility of living self-sufficiently. If you’re interested in design and projects, you can arrange your visit via the contact on the web page.